By Dan Ambrose: While boxing fans seem to be more interested in seeing former WBO super featherweight champion Adrien Broner (24-0, 20 KO’s) face WBC interim welterweight champion Robert “The Ghost” Guerrero (30-1-1, 18 KO’s) in his next fight, Oscar De La Hoya, the president of Golden Boy Promotions, seems to be more inclined to match the 23-year-old Broner against the tall and slender southpaw WBC lightweight champion Antonio DeMarco (28-2-1, 21 KO’s). He obviously wants to make that fight next and with DeMarco’s quick 1st round knockout win over #15 WBC fringe contender John Molina (24-2, 19 KO’s) last night at the Oracle Arena in Oakland, California, it’s highly likely that DeMarco will be able to face Broner before the end of the year, possibly even by October 6th. That would be pushing it a little, as DeMarco wouldn’t have much time to prepare for the Broner fight, but DeMarco is already in shape from having trained fro the Molina fight and he didn’t take any damage in that fight. 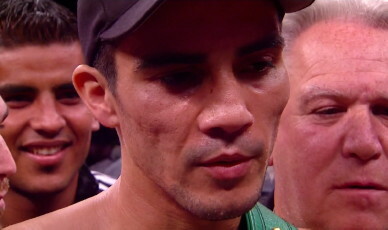 Molina only landed two punches before the fight was halted. DeMarco hurt Molina with a straight left hand that drove up to the ropes last night. DeMarco then flurried on the rattled Molina until the referee halted the fight with Molina partially sitting on the bottom ropes. The punch that DeMarco hurt Molina with wasn’t that big of a shot. It just looked like Molina wasn’t ready for it and then made a stupid mistake of trying to duck low in the corner to ride out a storm of punches from DeMarco instead of grabbing him to clinch. I would have to favor Broner over DeMarco. Broner is too strong, too fast and too skilled for the slender DeMarco. It would be like matching DeMarco back up with Edwin Valero again. Broner will break him down and easily beat. It looks like De La Hoya doesn’t want the Broner-Guerrero fight for some reason. I guess he’s going to try and keep Guerrero on the shelf just in case Floyd Mayweather Jr., the WBC welterweight champion, decides he wants to hold onto his belt by facing Guerrero. I think De La Hoya shouldn’t waste Guerrero’s time waiting for that fight to happen because it won’t. De La Hoya needs to make the best possible fight he can for Guerrero against whoever, because he’s not going to get Mayweather, no way.